Influencer Marketing – What, Why and How. Explained! 5) Finally having consumer to pay for your product or service. Though all of the above points aren’t sequential in nature but broadly consumers decision making goes through above mentioned steps before concluding a purchase. Traditionally marketing channels were good at reaching out to large consumers but the purchase decision was largely ‘influenced’ by someone the consumer would trust. This could be friends, relatives, colleagues, neighbor etc. With advent to internet this community of influencers has exploded. Online search, online communities & social media communities have expanded reach of consumers to new age influencers. These new age influencers can be consumers who take to social media for sharing their experiences of using products & services, bloggers who are domain specialists & online communities which have lots of likeminded consumers sharing information with each other. According to a Nielsen report 84% of consumers will take actions based on reviews from their trusted group of family & friends. They don’t trust ads as much. The above reports clearly state importance of engaging with ‘influencers’. 1)Is it worth engaging with these new age influencers? 2)How to engage with new age influencers? 3) What’s the right time to begin this engagement? 4) How to evaluate success or failure of such marketing initiatives? Answer to above questions lies in defining a framework for ‘influencer Marketing’ for your business. The hardest & most important step is to identify influencers for one’s business. If we identify a wrong influencer then not only our campaign, will backfire but it will lead to erosion of trust. Hence it becomes critical to identify correct influencers. Every business is unique in terms of size, scale, geographical reach, offerings etc. A B2B business will have a different set of influencers than a B2C business. In case the team running the business knows who are the influencers then the tasks of identification is easier. For example, if you are in a B2C business of selling mobiles, laptops etc. then commonly known review blogs & websites are Digit , NDTV Gadgets etc. In case if the business is of cars then popular review blogs are Team BHP , Auto Blog India if you are in real-estate then Indian Real Estate can be the place to find influencers for your business. The easiest way to identify influencer is to do a few Google searches around your product & service. I use this approach as the first step. Few months back our organization wanted to engage with influencers in the field of ‘Analytics’ to promote our Business Analytics Course. I went to Google & did few searches around keywords like ‘analytics course in Delhi’, ‘popular free analytics tools’, ‘Is R better than Hadoop for Analytics’. These searches threw multiple websites but two consistent results were Analytics India Mag, Analytics Vidhya . After reviewing content for its freshness, quality & engagement levels, I initiated first round of conversations with the bloggers who are running these websites. Today we use both these websites every month & our association has yielded good results. This route ensures that you get to know high quality sites as only website with high quality content will rank on Google. In case this approach is not working then you can go to specific social networks such as LinkedIn, Twitter etc. to review the list of influencers they publish. LinkedIn recently came up with its list of most watched profiles . There are lots of tools available which will fetch this information for you. 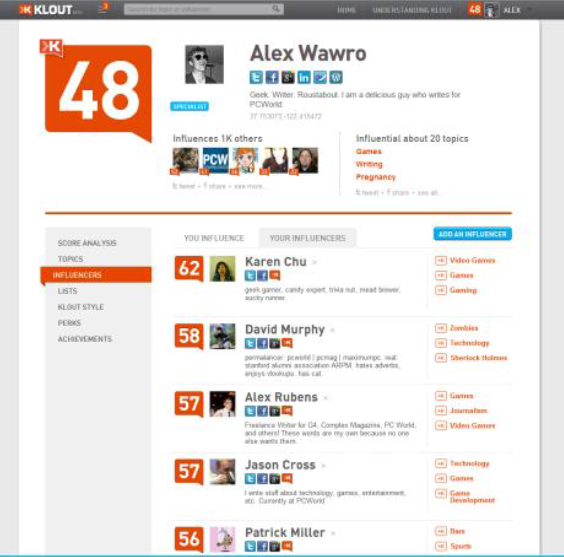 Tools like Klout , Buzz Sumo etc. aggregate info on popular content, influencers & present the same on intuitive dashboards. You can browse through & identify influencers. Lastly one must review Quora review chatter around ones product & services. It’s important that the influencer with whom you are engaging is aware of your objectives. In todays crowded social media communities there are a lot of self-proclaimed influencers. A lot of them will also boast of huge liker base, follower base but it’s very difficult to determine authenticity of these claims. One can acquire followers through paid campaigns. You should insist on reviewing analytics reports of their social handles on platforms like Facebook, Twitter, and Blogs. These reports will show you multiple metrics like paid v/s organic liker acquisition, user engagement, time on site, bounce rate etc. which will tell you if the individual can actually influence a certain audience. You will not find this challenge if you are engaging with a popular celebrity but that warrants deep pockets. Lastly deliverables should be clearly defined & agreed to. Payment model should be linked to these deliverables. e) Ensure that there aren’t festivities, big ticket events like IPL, elections, big movie release etc. during duration of campaign. These events create their own chatter which will suppress your campaign. Other way to deal with this is to customize your campaign around such events. f) Provision for last minute surprises i.e. any unplanned event that storms Twitter, Facebook & other online communities. You might want to delay your campaign in case such a thing happens. g) Create lot of content that will be used around influencer posts. It’s important that you sustain the momentum created by the influencer. Typically there’s a pre campaign duration, campaign duration & post campaign duration. The last step is to ensure that you deploy a social listening tool & analytics tool to track your influencer campaign. If you are already using these tools then you will just need to make few tweaks like define UTM parameters to track referral traffic in your analytics tool, create new goals & events if necessary in your analytics tool & create social listening campaigns in your social listening tool. In case you are not using any of these tools then you should sign up for a free analytics tool such as Google Analytics a free social listening tool such as Klout , Google Alerts , Social Mention etc. & start tracking your online campaigns. It’s important that you define benchmarks before begging of influencer campaign as it will help you determine impact of your influencer campaign on traffic & engagement of your website.